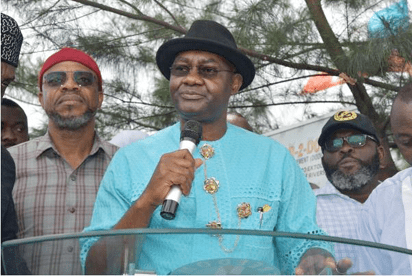 PORT HARCOURT: The Senator Representing Rivers South-East Senatorial District at the National Assembly, Sen. Magnus Abe, has declared that his ambition of becoming a governor in 2019 has been laid to rest. Abe also warned the National body of the All Progressives Congress, APC, against attitudes that would create crisis in the party in the state. Abe, who intended to become a governor on the platform of the APC, spoke in Port Harcourt during yesterday during stakeholders meeting of the faction of APC loyal to him. Abe noted that the Supreme Court decision on his appeal ended his move of becoming the next governor of state, calling on other candidates of the party to drop theirs and work for rebuilding of the party. He urged his supporters to henceforth end slogans describing him as governor, adding that the usual slogan of the party ‘Change’ should be readopted. Abe said: “This was a journey of faith, we moved without anything and we were not seeing anything ahead. But with faith we moved mounting. We have sacrificed so much and we may have nothing now, but we have stored up a lot, hoping the politics of state will be better. “We have come out to fight for internal democracy for the party. We have come out to say that things can be done better. We have made that point in a way that nobody can dispute when you next. When you talk next time they will listen to you. “We had said our final victory will be when we will be sworn in to take over the Brick House, but, sadly, it is clear to us now that our being sworn in is not what God wants now. We have to make it clear so we can move forward. “That dream is now laid to rest because of the pronouncements of the Supreme Court of Nigeria. As a lawyer we know that the Supreme Court is infallible, what ever they say cannot be dispute. “I feel pained as you all feel. I know that is not what we expected. From today, when you hear APC, don’t respond ‘Magnus the Governor’, say Change, the slogan of the party. Abe noted that he is not the leader of the party and does not want to be, stating that remains one of the leaders of the party like others. He said: “I don’t want to be the leader of APC in the state, but one of the leaders of the party that can be consulted. We will build a party that will understand the will of others. “Clearly, the judgement of Supreme Court has shown that the ruling of Justice Chiwendu Nworgu remains valid and was not procured. However, Abe, cautioned the national leadership of the APC to stop every act that would fuel crisis in the party in Rivers State, calling for peace and efforts toward rebuilding the party in the state. “There is need to begin the task of putting the party in order. I call on the national leadership to stop doing what will destabilize the party in the state but to work with Peter Odike, the Chairman of APC in the state, according the judgement of Supreme Court, to rebuild the party. “Anyone who looks that he is not ready to work with others he has to leave. Nobdoy can drive anybody out of the party except by following the constitution,” Abe added. Meanwhile, Peter Odike, Chairman of the Party, said the exclusion of the party from the ballot affected the party in the state.